Something teenagers do every day is also the thing that kills more of them every year than anything else: driving. Car accidents are the leading cause of death for 16 to 19-year olds, with more car accidents among that cohort of drivers than any other. 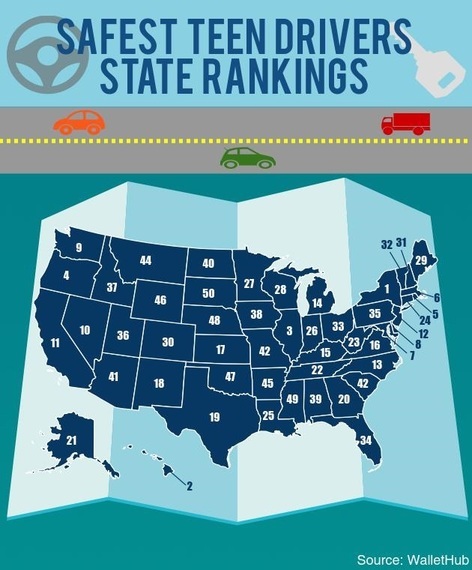 But there is good news for Illinois: a new study by WalletHub finds that the state is the third-best for teenager drivers. The study says car accidents are the number one cause of death for people in this age group and that an average of 260 teens are killed in car accidents each month. While the consequences of these statistics for teen drivers and their families are clear, having dangerous teen drivers on the road also can cause problems for the state's other motorists. In addition, the financial implications of those statistics are staggering. Although young people aged 15 to 24 represent only 14 percent of the population, they account for about 30 percent of the total costs of motor vehicle injuries. That's not counting auto maintenance, high insurance premiums, possible traffic citations and other vehicular incidents that can rack up expensive costs over time. The study looked at state laws that restrict various kinds of teen driving, the average cost of car repairs, accident information, statistics of teens who drive under the influence of drugs or alcohol and the number of teen drivers in a particular state. Check out Reboot Illinois to find out what experts say legislators can do to make driving safer for teens--and all who share the roads with them. Sign up for our daily email to stay up to date on all things Illinois politics.